"Quinn the Brain" was the third episode of the second season of Daria (episode number 203). It first aired on MTV on March 2, 1998. "Quinn the Brain" was written by Rachel Lipman. In English class, Quinn has had a bad grade but she pays no heed until O’Neill mentions she must have an A the following essay or she’ll fail. Helen and Jake, warned by the teacher, try to insist her daughter studies harder, but their arguments make no progress and it takes Daria to convince her when she mentions that Quinn could become the oldest of her class if she fails. However, Quinn tries to avoid working by bribing her sister to do the writing. After some negotiation, Daria accepts, only to refuse a moment later when Quinn unintentionally insults her. She reiterates her refusal hours later when Quinn has to cancel her date to work. Quinn eventually writes an essay entitled "Academic Imprisonment", comparing school to prison. It so impresses Mr. O'Neill — despite glaring mechanical flaws and a petulant tone — that not only he gives her an A as he reads the text aloud and later has is published in the school’s newspaper. The grade has unintended consequences: at the Morgendorffer’s, Quinn manipulates her parents into giving her money for the grade, a system Daria is quick to point the faults of by noting she had consistently maintained high grades for long. (Jake throws his wallet at the girls in a panic, declaring to Helen "I told you I was no good as this parenting crap!") And, at school, the consequences are deeper: Quinn’s published essay makes her appear smart and intellectual. She panics at the thought that she'll be considered a "brain" and lose popularity, while her sister is filled with sadistic glee for that very same reason. To both their suprises, Quinn's cuteness means she transforms being smart into a fad. Soon, Quinn is being asked by Mr O'Neill to tutor Kevin, gets to leave English class early, and finds everyone gushing over her half-assed poems. She even starts to think about becoming a writer because "it's not like it's real work". Daria goes from annoyed that both classmates and teachers assume Quinn to be smart when she's still being dumb, to despairing when O'Neill asks Quinn to tutor her in English. In an unguarded moment, a shaken Daria tries to talk with her father about it - admitting that she doesn't like the "brain" identity she's saddled with, but if it's 'stolen' then she's "got nothing". Unfortunately, Jake's response devolves into a panicked rant about his own failed life, ending with a plea to Daria that "You're still a young man! You don't have to live with your mistakes! Get out while you can!" She retreats, dryly commenting that "talking to you has made me feel better about myself" (he doesn't get it). Meanwhile, Quinn has her share of problems: with so many girls following Quinn’s example and wearing black (imitating Quinn’s intellectual poseur), a furious Sandi suspends Quinn from the Fashion Club. Sandi then sets out to draft Daria into helping convince Quinn to give up on braindom; unfortunately, the very idea of talking to the girl is too scary for Sandi to handle, and she retreats after two seconds. Quinn confides in Jane that while she loves how much her sister is being messed up by this, she thinks everybody’s making a big deal of her essay and doesn't understand why. She knows she's not as smart as everyone thinks. Jane explains how the girl has trained everyone to expect nothing from her and thus overreact to the slightest bit of effort, but it doesn't get through. Daria continues to despair that nobody notices Quinn's writing is rubbish and that she's losing the "brain" role to Quinn - and since Quinn's "a brain with bouncy hair", "I can't compete" because of the different standards ("no standards") the cute get. Unwilling to end up as an even less popular brain, when the Three Js approach her to get things back to normal, she has a plan of attack - one she knew would work all along but couldn't "bring myself" to do before. 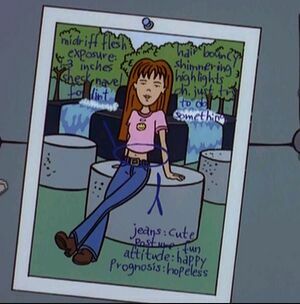 That evening, at the Morgendorffer’s, Daria takes a photo of Quinn, marked with a detailed list of 'attributes', and procedes to make herself up to resemble Quinn. When the 3 J’s arrive, loudly stating they’re coming to take Daria out ("by the way, how's Quinn? "), Daria starts to show off her new look in full view of her sister. After a few seconds, Quinn panics and flees for the J's, conceding defeat. The next day, everything is back to normal, as Quinn has reverted to her old self and clothes, has stopped pretending to be smart and quickly downplays her essay. A haughty Sandi accepts Quinn’s apology and lets her into the Fashion club again. Daria and Jane remark everything's back to normal - i.e. "Thinking: bad". When Daria dresses up as Quinn, the original broadcast played What Do You Want From Me? by Monaco which had lyrics that fit Daria's plotline and actions - you've taken my life away/Ruining everything/Give me something I can rely on/Far away from the life that I once knew. The DVD edits go with a generic wordless piece. To defeat the enemy, Daria must become the enemy. 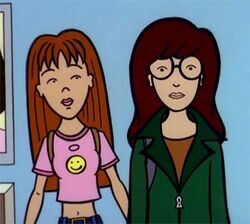 Daria remarks to Quinn, "You could be left back and be the oldest freshman at Lawndale High." This puts this episode during Quinn's first year at Lawndale High, and fits the 'two season = a year' theory of Daria timelines. Quinn's essay, Academic Imprisonment, is reproduced in The Daria Database. When Jamie White talks in the first scene, he has a different voice actor to normal. The usual actor comes back later. Jake is disgruntled that Helen won't let him talk to the girls and tells him he's the "back-up singer" in parenting. Jake "woke up middle-aged and resenting the hell out of it", and has bitterness lurking under the surface. Near the end, Daria gives a brief lament of "isn't there ever a time when how you look doesn't affect how you're judged? ", and trying to make herself up like Quinn is something she is loathe to do. This will come up again in "Through a Lens Darkly", where she again complains about being judged on appearance - and becomes upset with herself when she shows some vanity over her looks. The Three J's know Daria and Quinn are sisters, and Jeffy knows Daria's name. "Through a Lens Darkly" shows Daria can barely see without her glasses, so how the heck did she manage to Quinn up after she'd taken them off?! Daria already owned a long pink T-shirt. "Midriff flesh exposure: 3 inches. Check navel for lint." "Hair bouncy, shimmering, highlights. Oh just try to do something"
"Jeans: Cute. Posture: Fun. Attitude: Happy. Prognosis: Hopeless." In a scene where Quinn attempts to bribe Daria into writing her essay, Daria is reading Joseph Heller's Catch-22. Daria's report for Language Arts is on Death of a Salesman, and titled He Had It Coming. There are two ways to read Arthur Miller's "Death of a Salesman". The first is an American tragedy, the story of a "little man" whose spirit and life were crushed by the viciousness of everyday life. But a second (and in my view equally valid) way to interpret the story is as a morality play with a happy ending. Compromise your values, lose sight of your dreams, cheat on your spouse, and you're dead. Clean, [unreadable], uncomplicated. It's almost a happy fantasy, really. In fact, when I'm feeling depressed, I crack open "Death of a Salesman" and [unreadable] the funeral scene for a quick pick-me-up. As your daughter Quinn’s Language Arts teacher, it is my sad duty to inform you that Quinn is not working up to her potential and is in danger of failing Language Arts, which I teach. Now, I use the term “working up to her potential” deliberately, for it is my belief that all students have the potential to soar like eagles (educationally) when their imagination and interest are engaged, and in fact Quinn’s imagination and interest are engaged, just not by school or anything to do with learning in any shape or form. Ironically, I myself have learned quite a bit about current skort styles and materials by listening to Quinn and her friends, but unfortunately this does not help her grade. Would that it could! In any case, I thought you should know about Quinn’s poor performance so that together we can help bring her grades up. When teachers and parents work together as partners, Look [sic] out world, nothing can stop us now! This episode is a common rationale for the trope that Daria, underneath her unfashionable clothing and behind her glasses, is conventionally attractive - and very much so - and just covering it up. Quinn's reaction to Daria's appearance at the end of the episode is taken as evidence, that Quinn is scared of the school finding out how Daria really looks; although her reaction may simply be due to the idea of Daria being like her (just as Daria disliked Quinn taking her role), without regard for the level of success. A number of alternate endings to this episode have been written as a means of allowing the "cute" Daria to last longer than the trip from her room to Quinn's door. A novelization of this episode has been written by Martin J. Pollard. The story A Tale of Two Brains, by Richard Lobinske, of the John Lane series, has a somewhat altered version of this episode. This page was last edited on 25 April 2018, at 13:29.